ENLIGHTENED Christian Gathering Church leader Prophet Shepherd Bushiri, made a surprise private visit to Zimbabwe last week to spend days on hunting and shooting exercises. There was drama at a local hotel where the prophet, referred by his followers as Major One, was staying after scores of people thronged his room. The hotel security had a torrid time to control the multitudes of people. 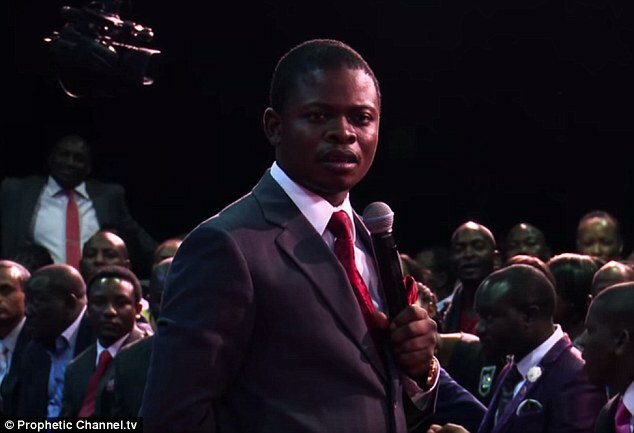 Prophet Bushiri, who has about 4 million Facebook followers, ignited a fierce debate last month when he prophesied that Zimbabwe would be transformed into a Dubai. He claimed that God had shown him in a vision a new city which will look like the United Arab Emirates' city – Dubai – in six years. Weeks later, the clergy flew aboard his private jet and spent a few days in Harare and Buffalo Range. He spent time at an exclusive lodge in the low-veld which previously hosted the likes of billionaire Bill Gates and musician Shakira. ECG founder's external media relations officer Mr Maynard Manyowa confirmed the visit. Prophet Bushiri said, "I really had a wonderful time in Chiredzi, Zimbabwe, this past week. "I took some time off for a small holiday and went out to Mabalauta Dumisa Camp site where I did some range shooting exercises and visited the National Parks in that area. "It's always good to take some time out, relax and enjoy the beautiful creation God has blessed us with. It is at such moments that you can hear the gentle whispers of God speaking to you. "He did this to me and I want to announce to you that God said this month will be a Month To Remember. "God is going to prove to the entire world that He is still in the miracle working business. "I see Him opening doors for you, elevating you, sanctifying you and setting you apart from your peers. The blessings coming to you will be so numerous!" Last month Prophet Bushiri challenged Zimbabweans to remember his prophecy six years from 2018. He said, "Remember my word, my prophecy, in the next six years from now, you will see something that looks like Dubai being built in Zimbabwe. I saw the roads in this city, I saw the buildings, wonderful things about this city. "God is about to do something, He will do it not with an individual but with Zimbabweans. Not one woman, not one politician but all of them together. God is doing a new thing in Zimbabwe. "Raise your hands and pray for the nation of Zimbabwe. I will bless Zimbabwe, says the Lord. God will rise in His power and bless the people of Zimbabwe. "They will not cry anymore. I see the land which will take away the shame of Africa. "Zimbabwe is about to be blessed. God is restoring Zimbabwe. Zimbabwe is a unique sleeping giant. It's not the first time that I have said this. God has remembered the apple of his eye and the country is now sitting on the foot of prosperity."